One of the most common symbolism that you’ll see in pictures of the Annunciation in Western religious art is a lily (or lilies!) in a jar or pot. Then, you have this picture, which is a grand scene, made with gold! 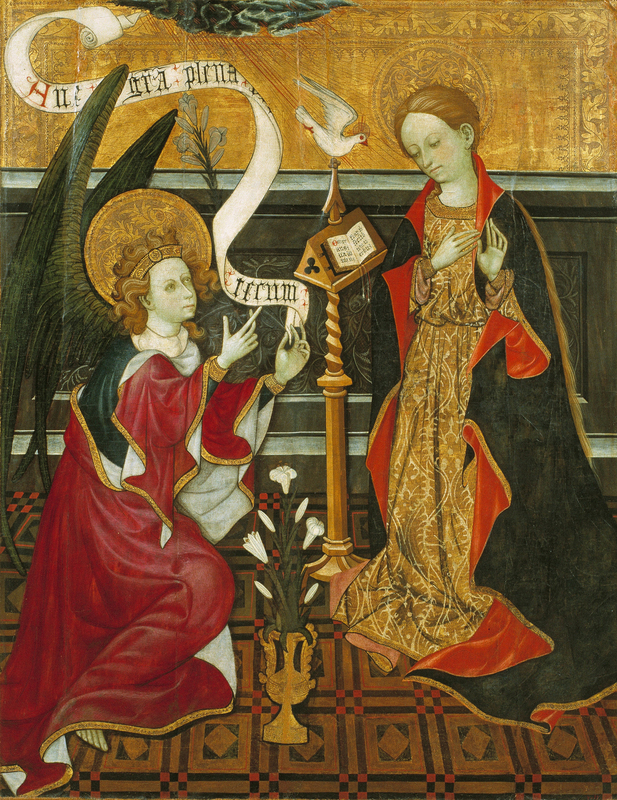 Annunciation, c. 1420. Museu Nacional d’Art de Catalunya, Barcelona, Spain. The angel Gabriel comes down to Mary, saying, “Ave Maria!” (or, in English, “Hail Mary!”) carrying a sprig of lilies with him. The Holy Spirit descends on Mary as a dove, with God the Father depicted as a ray of heavenly light. Mary takes a break from reading sacred scripture to give her Fiat. And… in addition to the sprig of lilies that the angel is already holding, there is a pot of lilies in between them. So, what’s with all the lilies and flowers in pots? White lilies are common symbol of virtue and chastity. So, in art you’ll sometimes see St. Joseph holding a lily, which symbolizes his chastity, as his role of father and protector. You’ll also see the white lily with Mary to represent her perpetual virginity! And very often in Annunciation art, the angel Gabriel will hand Mary some lilies to represent this. So, that’s one reason why lilies are common. But the pot of flowers is symbolic of another legend that was popular in medieval times in the West! As the story goes, back in olden times, a Christian and Jew were talking together, and the Christian was trying to explain the doctrine of Mary’s perpetual virginity, using a flower as an analogy. As he tried to explain, just as the green stem of a flower plant produces a beautiful flower without man’s intervention and without harming the stem, so was it with Our Lady when she conceived our Lord. The Christian apparently wasn’t doing very well with his explanation, because the Jew remained very much unconvinced. Finally, the Jew interrupted, pointing to the wine pot that lay between them, and said that he would believe in Mary’s perpetual virginity when the pot sprouted flowers. Instantly, a white lily — the most beautiful white lily that either had ever seen — appeared out of the pot, much to the surprise of both the Christian and the Jew. At that miracle, the Jew fell to his knees and declared that he believed, not only in Mary’s perpetual virginity, but in Jesus as Lord. And so he converted to Christianity and lived as a Christian from that point on. So, if you’re looking at pictures of the Annunciation and see a pot of flowers, remember! It’s yet one more image symbolizing Mary’s perpetual virginity! Thank You for so many examples of chastity, both in Your life and in the life of Your saints. Pray that we keep chaste as well, in whatever circumstance we find ourselves. This is one of the pictures depicted in my new book, The Joyful Mysteries, which is on sale now! Click here for more details.